An easy honey garlic roasted brussel sprouts recipe – they’re tender on the inside, have crispy edges and an amazing honey garlic flavour! I have never liked brussels sprouts. Just one of those things that never appealed to me. I think that this is because I had never had them cooked any way other than steamed. Roasted brussels sprouts? That’s a whole different thing. 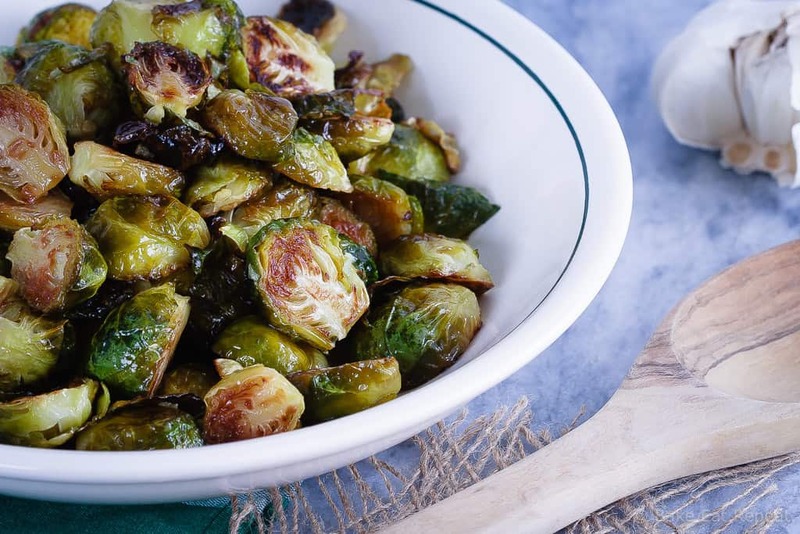 This honey garlic roasted brussel sprouts recipe was fantastic. I discovered roasting brussel sprouts a couple of years ago, and I’m so happy I did. Brussel sprouts are one of those sides that my husband loves, but I never cooked for him because I didn’t like them. Some people like them steamed, but I think roasting them is the best way to cook brussel sprouts. Roasting them has convinced me to actually want to make this little vegetable occasionally, which equates to a happy husband. And happy kids. Evidently they like brussels sprouts. Whose kids are these anyways? Granted, I did coat them in honey, so maybe it’s the honey they like? That and the fact that my boys have decided that brussels sprouts make them strong and they’ll be faster, better hockey players if they eat them. I’m kind of okay with this. Hey, if it makes them gobble up their brussels sprouts, I’m all over that little idea. Pretty sure all the veggies are going to be “make you better hockey players” food now. Whatever works, am I right? At any rate, these honey garlic brussels sprouts were quite tasty – and that’s from a self professed brussels sprouts hater. These brussel sprouts are a bit sweet, tender on the inside, with crispy edges that I loved. 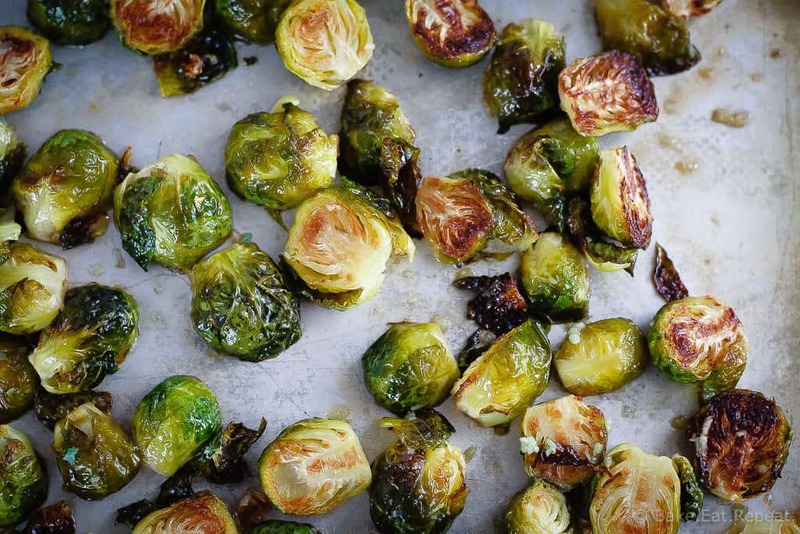 If you like brussel sprouts, you’ll love these. And if you don’t like them, try these ones, you may be surprised! These honey garlic roasted brussels sprouts are fairly sweet. If you don’t want them to be that sweet you could decrease the honey garlic mixture to half the amount called for for a less sweet version. Honey garlic roasted brussels sprouts - tender on the inside, crispy edges and honey garlic flavour - a great way to change up the usual side dish! Spread the trimmed brussels sprouts on a rimmed baking sheet, drizzle them with the olive oil, and sprinkle the salt over top. Stir them around to coat them with the oil and then roast for 15-18 minutes, until tender. In a small bowl, whisk together the honey, lime juice and minced garlic. Drizzle this over top of the roasted brussels and stir to coat. Roast for another 3-5 minutes and enjoy. Source: Adapted from Cookie Monster Cooking . I made these for supper last night and they were delicious! 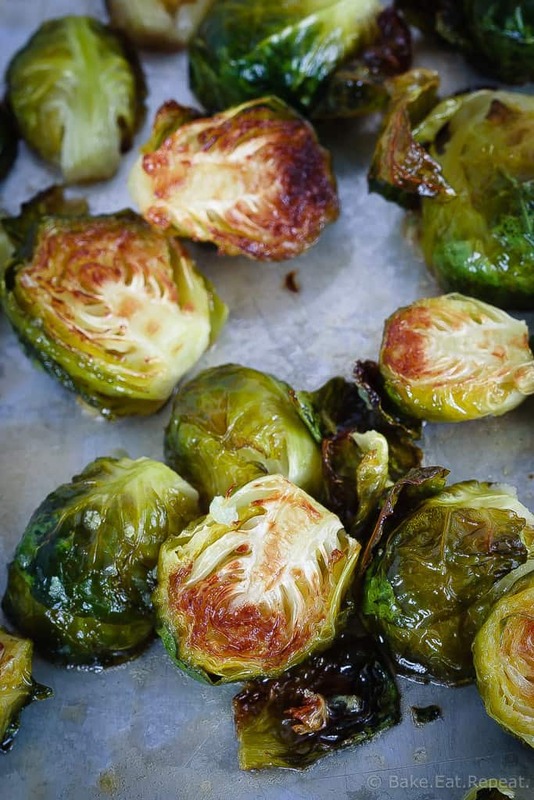 I love brussel sprouts and will definitely be adding these to the rotation! Thanks Andrea! So glad you liked them! I didn't always love brussels sprouts but I really do now - especially roasted. It makes such a difference and this honey garlic combination sounds incredible! Can't wait to try this :) Hope you and your family have a wonderful Thanksgiving! Just love this flavour! Yum! These sound amazing. I love balsamic sprouts, but I haven't tried them with honey before. Will be definitely trying this recipe. Oooh, balsamic, that sounds good! I'll have to try that next time! Thanks Dannii! Homegrown Brussels sprouts of bitterness doomed me during childhood, but roasting is DEF the best way to go! My husband loves Brussels sprouts too, even steamed...who knew?! My husband likes them done any way, but I cannot handle them steamed at all. Roasting though, that's pretty good! I've been looking for a new recipe to try at Xmas this year. These sound amazing so i will try them out on my two sisters (one of which being your mother in law - ha ha) and the rest of the family. I'll let you know how it goes. Love your blog and the way you write. Well done Stacey! Thank you so much Barbara! Hope you like them! Great recipe! I love roasted veggies. The natural sweetness comes out and they get so crisp. Better than chips! I don't know if I'd go that far, but way healthier! And definitely the best way to cook veggies in my opinion! Thanks Mir! I made these to take to a Thanksgiving dinner and everyone loved them. I was asked to bring them to Christmas dinner!!!! Thanks Kathy! I'm so glad you liked them! I was never a big fan of brussel sprouts growing up, but now that I've had them prepared in different ways, I love them! Your honey garlic version sounds fantastic, Stacey! I love that you roasted them, too. Sounds like such a great side dish! This is honestly the first time I've ever liked them, I even had them for lunch the next day after taking photos, which told me I must have liked them a lot! I think roasting makes all veggies better! Thanks Gayle! Haha, honey and garlic make everything better, it's always good! Thanks Ashley! I loooove Brussels sprouts! Though that certainly wasn't always the case. We just bought a whole stalk of them for the first time ever and we stared at it now sure how we wanted to prepare it. Made it last night though on the grill. Next time we grab a stalk, I will totally be trying this instead! Honey and garlic a a glaze sounds fantastic! A stalk? Really? You can buy them like that? Of course, I live in the frozen north so maybe that's why I've never seen them that way! I bought a bag. :) Thanks Sarah! Yum!! I actually do really like brussels sprouts, and would eat them pretty much all the time. My husband on the other hand, is pretty darn picky about them! I think he would like this sweet and savory combo though! These look amazing! I have to admit, there's a brussels sprouts side dish recipe from Momofuku that I adore (made with fish sauce - weird I know, but SO GOOD) that I now make all the time for Thanksgiving. However the combination of honey and garlic on these sounds irresistible! Thanks Mary! And thanks for stopping by!